Home » Exchange Server » Failed to Add PST in Outlook 2016 (Error 0x80004001) – How to fix them? Every time is not the same, and every problem is not same to fix. So, here is some tract to fix Outlook error 0x80004001 which infrequently prompts while adding or importing PST File in Outlook 2016. Hope, this will assist you in fixing the error 0x80004001 or whenever you couldn’t import PST file to Outlook. Every Professional user knows the significance of data. Whenever you failed to import PST file to Outlook and encountered the error 0x80004001, what will fix it an instance? If you have the same questions and wanted instance fixing tract, You are in the right place because you require sharing your PST File with others. So, this articulation is excellence to fix the prompting error 0x80004001. Here’s I’m giving you half dozen of tracts to fix the error 0x80004001. Scrutinize your system that it has loaded with antivirus program or the Windows firewall setting has conflicted with Outlook functioning. If yes, then embellish the settings of your antivirus or Window firewall so that it will help you out from the encounter of error 0x80004001. Then, antivirus and Windows firewall will not be the factor of error 0x80004001. Might, this process for importing PST file will help you out and settle the Outlook error 0x80004001. This can happen when the Outlook PST file stores on the network. Might this action may lead to deprave in PST file. To prevent your crucial Outlook PST data, eternally store your latest backup of Outlook PST File on your system too. Infrequently, wrong details make hurdle in your path and flaw-free executions. So scrutinize the Account Settings of your Outlook Account profile to ascertain that all of the details mentioned are accurate or no. If you find any flaw or wrong info details, change that details with the immaculate and ensured by you. Outlook users might also be interested in Repair Outlook PST files. Hope, this tract will work for you too. Frequently, opening Outlook in Safe Mode assists the users to work in a hassle-free environment. This can restart implementation and will allow you to add PST in Outlook. The PST file can be corrupted, so take care of your PST File because it can cause failure in implementation of importing. PST File can cause power failure, software conflicts, oversized PST. 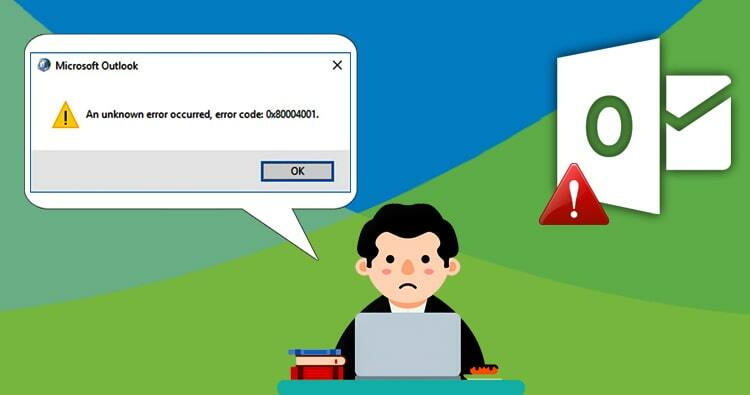 It can also create issue such as hardware issues, emergent termination of Outlook, faulty networking device, and virus/ malfunction invasion, etc. So, Check out your Outlook Mailbox data and delete suspicious emails in the Outlook mailbox, might these may cause corruption in your Outlook profile and the PST file data. There is two easy way to repair a corrupt PST file. You can choose anyone for the repairing. You can utilize Inbox Repair Tool (scanpst.exe) which is inbuilt PST repair application for Outlook Data files. You can also go with an ambidextrous tool to repair your corrupted and damaged PST files. Shoviv PST Repair for Outlook is a proficient tool in order to handle such situations. Hope, you’ve fixed the error 0x80004001 with the tracts given above. However, the effectiveness of these tracts based on specific factors that caused the error. Moreover, though the error occurs due to damaged or corrupted PST File. I recommend you to utilize, Shoviv repair for Outlook, which is proficient to address exceedingly damaged and corrupted PST file.